Independent Directions to this Site: From Highway 416 take exit 72 (West Hunt Club Road). If southbound, a 0.4 km offramp dumps onto West Hunt Club Road, where you will turn right or southwest. If northbound, the 0.2 km offramp brings you to Cedarview Road, where you will turn right or SSE onto it and in 0.2 km come to West Hunt Club Road. Turn right or southwest onto it and in 0.4 km join the southbound traffic. Both groups will now follow West Hunt Club southwest for an additional 2.1 km to reach Moodie Drive. Turn left or SSE onto it and drive 2.1 km to reach a parking area on the right for the Lime Kiln Trail. 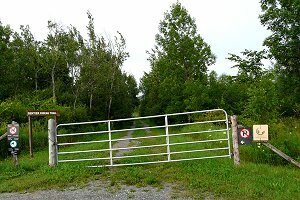 Stony Swamp Loop Route Directions: From the Jack Pine Trail parking area, turn left or southeast onto Moodie Drive and proceed 0.7 km to the parking area for the Lime Kiln Trail. 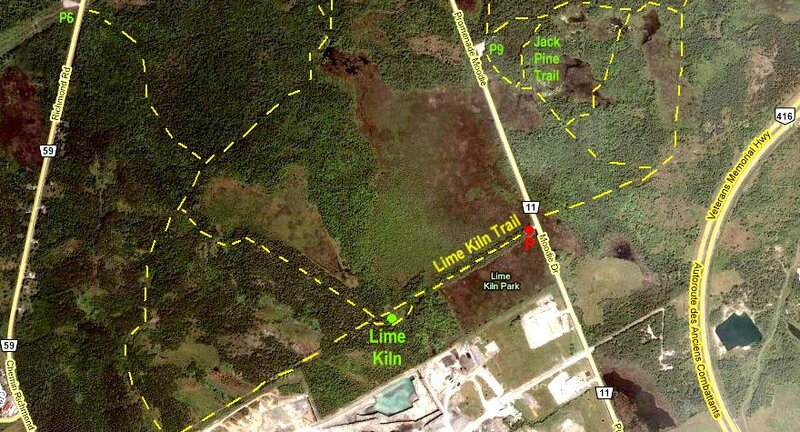 Site Description and Birding Information: This trail passes through 0.8 km of marsh and forest to reach the Lime Kiln, a reminder of local history. A continuation to the southwest goes through forest and overgrown fields to reach Richmond Road in 2.1 km. A continuation to the northwest goes through forest and marshland 1.1 km to meet a trail trending roughly NNE to SSW. If you go SSW you will meet the southwesterly extension of the Lime Kiln Trail in 1.2 km. Going NNE 0.3 km brings you to a trail going northwest, which goes to P6 and the Richmond Road Trails in 1.0 km. Continue northeast and you will join the Beaver Trail system in 0.9 km. Across Moodie Drive and just to the north is the eastward continuation of this trail, which leads to the Jack Pine Trail in 0.4 km. There is very limited parking here at the entrance. Both portions form part of a loop in the Rideau Trail system. Stony Swamp Loop Route Directions: From the Lime Kiln Trail parking area, turn right or southeast onto Moodie Drive and proceed 1.7 km to Spectrum Way. 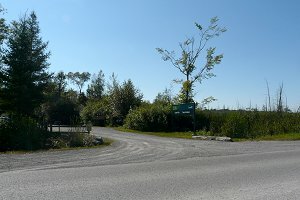 Turn right or southwest into Spectrum and drive 0.1 km to the parking area for the next site on this loop, the Monaghan Forest. Alternately, you could continue 0.4 km past Spectrum on Moodie Drive to reach Fallowfield Road, then turn right or southwest onto Fallowfield and proceed 0.7 km to a second parking area for the Monaghan Forest to the right or NNW.